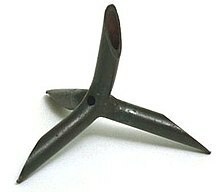 Caltrop used by the US Office of Strategic Services. The hollow spikes puncture self-sealing rubber tires. The hole in the center allows air to escape even if the other end of the tube is sealed by soft ground. Caltrops are spiked weapons used against men and horses since at least as early as Roman times. Later versions were designed to deflate automobile tires. They are a type of anti-personnel weapon, and anti-vehicular weapon. Japanese samurai used a similar weapon, the makibishi. Iron caltrops were used as early as 331 BC at Gaugamela. They were known to the Romans as tribulus, meaning 'jagged iron'. They were used in the Battle of Carrhae in 51 BC. The armed chariots used in war by Antiochus and Mithridates at first terrified the Romans, but they afterwards made a jest of them. As a chariot of this sort does not always meet with plain and level ground, the least obstruction stops it. And if one of the horses be either killed or wounded, it falls into the enemy's hands. The Roman soldiers rendered them useless... they strewed the field of battle with caltrops, and the horses that drew the chariots, running full speed on them, were infallibly destroyed. A caltrop is a device composed of four spikes or points arranged so that in whatever manner it is thrown on the ground, it rests on three and presents the fourth upright. In more modern times, they were used by both the Allies and Axis during World War II to puncture the tires of wheeled vehicles. 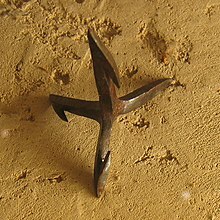 Improvised caltrops, usually made of welded nails, have also been used occasionally by labor activists in the United States during strikes to destroy the tires of vehicles belonging to management and replacement workers. In the labor context, these devices are more often called jack rocks. A recent example of the use of jack rocks in labor disputes was in 2012, allegedly by two men on a picket line at an aluminum products plant in West Virginia. ↑ There are different spellings of this word, such as caltrap or galtrop. ↑ Lewis, Charlton T. & Short, Charles 1879. A Latin dictionary. ↑ Jarymowycz, Roman Johann (2007). Cavalry from hoof to track: the quest for mobility. Praeger. p. 20. ISBN 978-0-275-98726-8. ↑ Renatus, Flavius Vegetius (390). "Armed chariots and elephants". The Military Institutions of the Romans Book III: Dispositions for Action. ↑ Nyden, Paul J. (August 9, 2012). "Two arrested in strike at Constellium". The Charleston Gazette. Charleston, WV. Retrieved July 9, 2015. This page was last changed on 20 November 2018, at 18:41.